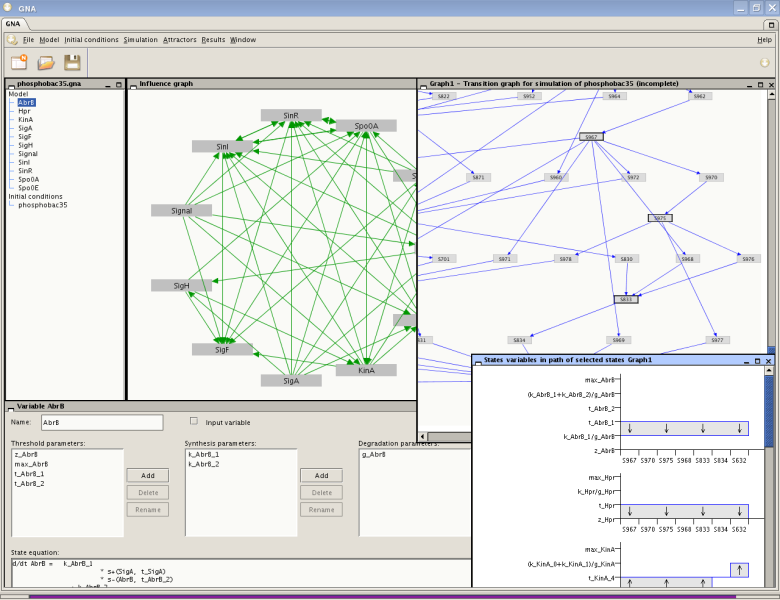 Genetic Network Analyzer (GNA) is a computer tool for the modeling and simulation of genetic regulatory networks. The aim of GNA is to assist biologists and bioinformaticians in constructing a model of a genetic regulatory network using knowledge about regulatory interactions in combination with gene expression data. Genetic Network Analyzer consists of a simulator of qualitative models of genetic regulatory networks in the form of piecewise-linear differential equations. Instead of exact numerical values for the parameters, which are often not available for networks of biological interest, the user of GNA specifies inequality constraints. This information is sufficient to generate a state transition graph that describes the qualitative dynamics of the network. The simulator has been implemented in Java 1.5 and has been applied to the analysis of various regulatory systems, such as the networks controlling the initiation of sporulation in B. subtilis and the carbon starvation response in E. coli. See the website of Genostar for references to these and other examples. The export of the state transition graph to standard model-checking tools in order to automate the analysis of important model properties. The export and import of models in SBML format. Genetic Network Analyzer is freely available for non-profit academic research by making a user licence request. Non-academic users wishing to use GNA - or academic users wishing to use GNA for purposes not covered by the user licence - are invited to contact the Genostar company. Genostar has integrated GNA in its IOGMA environment for exploratory genomics. More information on how to use GNA can be found in the tutorial and the installation guide. The main developers of GNA are Bruno Besson, Estelle Dumas, Hidde de Jong, Pedro Monteiro, and Michel Page. H. de Jong, J. Geiselmann, C. Hernandez, M. Page (2003), Genetic Network Analyzer: Qualitative simulation of genetic regulatory networks, Bioinformatics, 19(3):336-344. GNA uses the following open-source software: JGraph, SAT4J, and CUP.